New Orleans is a city that's every bit as vibrant, colorful, and loud as you'd imagine. That's what I learned when I finally made a pilgrimage to the Big Easy earlier this month. Houses were painted neon colors, jazz bands roamed the streets, and—no surprise—the fashion was exactly the right amount of over-the-top. Having spent most of my life in Oakland and Berkeley, I'm a bit of a granola-girl stereotype. Yes, I prefer Birkenstocks to heels; no, I don't own anything ruffled or ball gown–esque. But finally visiting the South has changed my perspective on polished dressing. "When I moved to New Orleans, I was fascinated by the number of women who really stick to the idea of Southern polish," says Coeli Hilferty, co-owner of NOLA boutique Pilot and Powell. "There is an exuberance and excitement to dressing down here, whether it is costuming for a parade, head-to-toe dressing for lunches, or breaking out the best white-tie looks for Mardi Gras balls." Bright colors, classic silhouettes, and statement jewelry are all part of the Southern uniform, which means that shopping down South is a different experience than anywhere else. 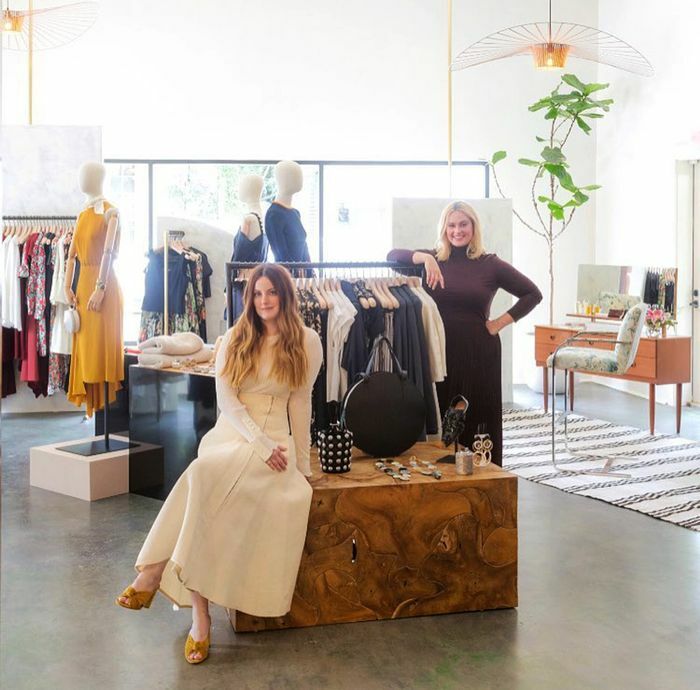 Kathryn Bullock, the second half of the Pilot and Powell duo, explains, "We are typically drawn to those striking pieces that some bigger-box retailers deem as too risky, but Coeli and I have found that women very much respond to our methodical yet emotional edit of a collection." Bullock and Hilferty count brands like Rosie Assoulin, Rosetta Getty, and Lizzie Fortunato as consistent favorites. But beyond brands, Southern women have a distinctly different way of dressing. Sure, they wear the same brands that I and other NYC women love, from Scandi favorite Ganni to New York's Rachel Comey, but their mixing and matching just isn't the same. So what's the secret to pulling off New Orleans style? Below is a breakdown, along with shopping picks from Pilot and Powell, to help you embrace NOLA style. Here's me doing my best take on Southern dressing, wearing a cherry-print dress and mule sandals. "Ladies in New Orleans plan ahead and buy looks with an occasion in mind," Hilferty says. "This is a big lesson that our clients and Kathryn have taught me. Southern women have perfected the art of occasion dressing!" While dressing for the event will mean something different for different women (if floral prints aren't you're thing, that's okay), we can all take a cue from the impressively dressed New Orleanians, especially when it comes to figuring out how to pull off colorful or printed styles. "New Orleans sits at an intersection of Southern respect for traditions and an overriding irreverence for anything that appears too ordinary or stifling," adds Bullock. While personally, I can't promise that I'll ever do more than appreciate from afar the sophisticated style of Southern women (just try to picture me in a fascinator), my take on the New Orleans aesthetic still touches on the idea of occasion dressing. Above, you can see how I interpreted NOLA style in a subtler way. Meanwhile, keep reading, and you'll find that my friend Ray went in a completely different direction, effortlessly pulling off a retro-inspired look. Available in sizes IT 36 to 39. Color? check. Classic accessories (including vintage plastic-heeled wedges)? Check. Even New Yorkers can forgo all-black and pull off the New Orleans vibe. The bottom line: Southern polish is an idea that can be adapted to work for all women, no matter what your personal style may be. When shopping, or even just picking out your next outfit, make your decision with occasion in mind. Find ways to use accessories or clothing details to fully embody exactly what you're dressing for. Now, book a trip to NOLA stat. You'll already know exactly what to wear. Available in sizes UK 8 to 12. Available in sizes FR 36 to 40. Now you're all set for a trip to the south.